As one of the greatest inventors ever, Thomas Edison not only has great inventions but also has many inspirational and wise words for us. You must be familiar with these words – "Genius is one percent inspiration and ninety-nine percent perspiration." And here are more great Thomas Edison quotes to goad you to work harder to reach the best. You must always keep your eyes wide open! Never give up before you succeed. The only rule is to succeed. This is what every job should be like. A man's character may influence their creations. Always keep a positive attitude towards what you did. No man can ever be 100% satisfied. There is always something more to be achieved. Sometimes, bad ideas are useful too in life. Sometimes we just miss some disguised opportunities. Three most important things in life. We should put more efforts in what we are doing. The more you work, the more you achieve. This is the correct attitude! If you keep working and waiting, inspiration will come. 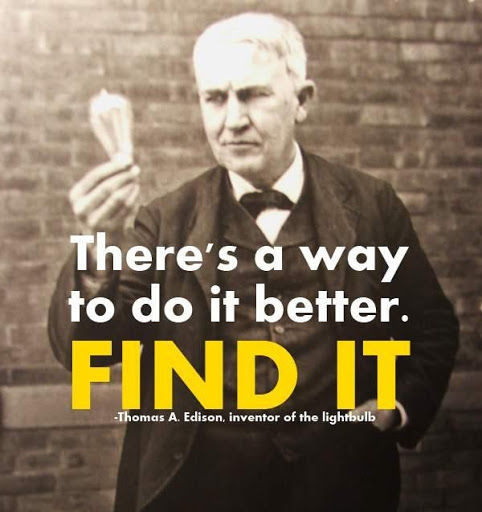 One of the coolest Thomas Edison quotes! In case you didn't know; this is what genius is. Never stop until you find it! So we are all on our ways to success, hopefully.